I came across the article below that summarizes the “7 Habits of Highly Effective People”, by Steven Covey who died today. I’ve added my commentary about the implications to working mothers. After reading through the 7 Habits, and thinking about the Working Mother, I honestly believe that Working Mothers have it harder at first, but over time, the fact that we work and have kids sharpens these skills and actually puts us at an advantage. Perhaps being a seasoned Working Mother by definition means that you are “highly effective”. 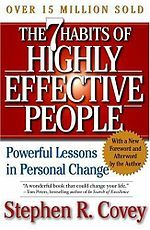 “In honor of renowned author Stephen Covey, who died this morning at age 79, we’ve decided to succinctly break down the “7 Habits of Highly Effective People” from his all-time best-selling book, which sold 20 million copies. Sometimes this is difficult to believe in when you feel that you need to provide the best for your family. I’ve written a lot recently about the tradeoffs between Money and More Quality Time with Your Family. You may FEEL like you do not have a choice, but in many cases you actually DO have that choice. Take charge of your life. You only get one of them. Believe in the choices that you have in front of you. See the choices. Believe that they are within reach. Do not fear change. Go for it. Whether it be the decision to scale back work to spend more time with your children, or go for that promotion at work, or decide to change jobs/careers… you get it. Don’t get stuck. Believe in yourself and KNOW that you DO have choices in front of you. You need the courage to SEE them. This is also difficult for working mothers to do at first. Sometimes our time horizon is just getting through the week, or even getting through the day unscathed. It is difficult to raise your head above the day-to-day craziness and juggling of work and home to see that longer-term path. But I’ve heard that it gets easier. And as the kids grow your time becomes more of your own. And your focus can be realigned more with your career. But even if it is not, even if you want that long-term horizon to be you as a mom being the best mom you can be, you can still chart your course. Imagine, visualize, and then make happen. For me, I’ve always envisioned being the one to drop off the kids at school and being there for them for pick up and to help with homework while food is cooking; that vision is still in my mind. And I am still working hard to make that happen. We have a leg-up here ladies. If ANYONE can multi-task, resolve problems, prioritize, and effectively use our time, WE can. We can do this in our sleep. Being a mom has trained us. Applying these skills professionally becomes more natural to us. Think of whack-a-mole. Working mothers, I believe, are simply trained personally and professionally to excel here. Think about how you negotiate with your children. Think about how you position things/plans/activities/responsibilities with your kids to get them motivated to do the things you want them to do. For example, giving them a CHOICE between something (e.g., carrots, or string beans?) and packaging it in a way that makes it seem like they are in control. They feel independent, and you get them to eat their veggies. Win / Win. We know how to do this and we do it daily with our kids. All of the time. This is a skill that we have perfected. Again – being a mom has surely helped you to go beyond your own needs to think about the needs of someone else. As your babies grow, they communicate to you. We’ve learned that to stop the tantrums from happening, we proactively LISTEN to our children and we let them know that WE HEAR them and that we UNDERSTAND. We REPEAT the issue to the child (my goodness that IS a big owie. You must have been scared when you fell down. That must have hurt you!). Providing a solution afterwards is always easier after the person/child knows that you’ve heard them, see them, and understand. The wonder of our children help us here. Their minds are unlimited. They don’t have strict biases. They are possibly the most creative that they will be – over time our creativity becomes stiffled for some reason. I believe that working mothers can learn from our children here and apply how children think to the working world. Keep an open mind – break down your barriers of thought. Working moms are lucky to have their kids serve as role models for them. This is commonly understood. “A happy mommy is a happy family”. You need to take care of yourself. Working mothers become aware of this need almost immediately – almost the first day back from maternity leave. The question of “how the hell am I going to be able to DO all of this?? ?” and then short-changing yourself. It is not sustainable. Hopefully the working mother learns this early and makes choices early on so as not to lose herself. What do you think???? What else resonates with you??? Please share your thoughts! « Random Thoughts: How do you commute?